Friday, August 17,11:00 a.m., as part of the Ellsworth Antiques Show. Lecture and book signing by award-winning architect and author Gil Schafer III with complimentary coffee and scones. This lecture is included in the price of general Antiques Show admission which can be purchased here. 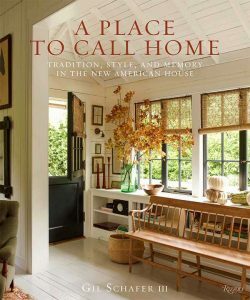 Award-winning architect and author of the new book A Place to Call Home, Gil Schafer believes the most successful houses are the ones that celebrate living—houses with timeless charm that are imbued with memory and a distinct sense of place. It’s this dialogue between past and present that enables him to interpret traditional principles for a multiplicity of architectural styles within contemporary ways of living. Join Schafer as he opens the doors to his world of comfortable classicism, sharing some of the firm’s most recent, and exciting, projects from around the country and walking through the inner workings of his distinctive approach—from concrete techniques to the more emotional and intuitive aspects of his process—showing how he brings his projects to life and fills them with soul. Award-winning architect Gil Schafer III is one of the world’s leading experts on contemporary classical architecture. A member of Architectural Digest’s AD 100 and a winner of Veranda’s “Art of Design Award,” Schafer is a member of the Yale School of Architecture Dean’s Council, a trustee of the Thomas Jefferson Foundation, and served as president and then chairman of the Institute of Classical Architecture & Art for over a decade. He holds a Masters of Architecture from the Yale School of Architecture and is the author of the bestselling book The Great American House and the newly released A Place to Call Home. Schafer’s work has been featured in numerous national and international publications, including Architectural Digest, Elle Décor, Veranda, The New York Times, and The Wall Street Journal. When he’s not traveling for work, Schafer divides his time between New York City, upstate New York, and Maine.